HomeHow Do Cells Change and Die in the Human A-T Brain? 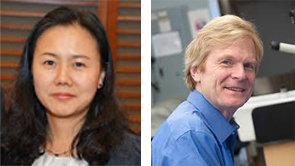 The A-T Children’s Project has funded the laboratories of E. Alice Lee, PhD and Christopher Walsh, MD, PhD of Boston Children’s Hospital and Harvard University to examine how DNA damage accumulates and how genes are turned on and off differently in brain cells obtained from post-mortem patient brain tissue samples donated by A-T families. Children with A-T gradually lose cells in their cerebellum, an area of the brain critical to the coordination, precision, and accurate timing of movements such as posture, gait, balance and speech as well as some cognitive functions. Although scientists confirmed long ago that skin and blood cells of A-T kids have trouble sensing and correcting DNA damage, what they really wanted to look at was DNA damage in brain cells obtained from the cerebellum of A-T kids, where cells are most vulnerable. Unfortunately, because of the brain’s complexity, studying specific cell types in mature, human brain tissue has been too challenging – until now. Harnessing a new technique called single-cell sequencing, Drs. Lee and Walsh will study how much DNA damage accumulates in cerebellar cells from A-T donors compared to brain cells from age-matched, healthy donors. In addition, they will use the new technique to examine RNA and see which genes are turned on and off differently. Both types of data are likely to produce new insights about how brain cells in A-T children become sick and die and may even reveal specific proteins or mechanisms that could be targeted by drug development efforts.